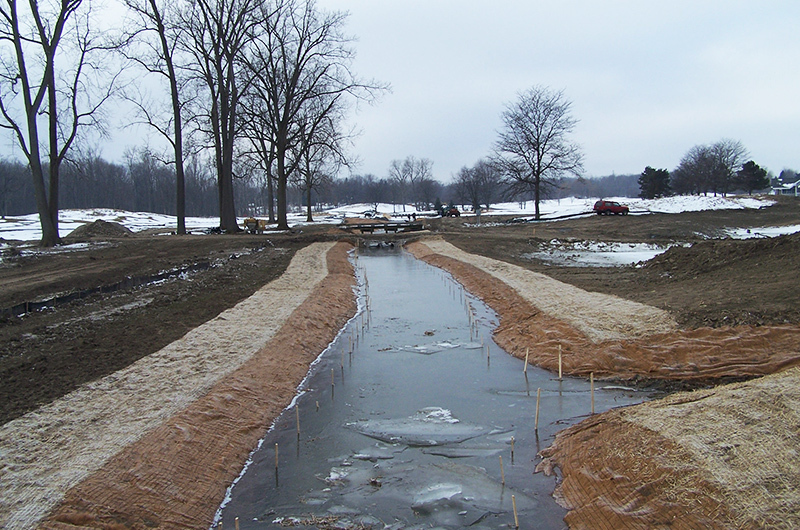 The Galloway Drain Improvement Project involved portions of Fieldstone golf course in Auburn Hills, Michigan that were developed into flood storage and stormwater quality improvement areas that serve as Naturalized Area features on the golf course. These areas collect runoff from the golf course as well as flood waters from the Galloway Drain (a tributary of the Clinton River) that traverses the site. Prior to restoration, short grass was kept mown very close to the near-vertical banks of the Galloway Drain, leaving very little vegetated buffer to filter stormwater runoff and help protect the banks from erosion. The stream was being down cut as the channelized flow removed material from the stream bed causing large amounts of sediment to be suspended and carried downstream. The golf course did not contain adequate stormwater storage to contain and treat the direct golf course runoff or floodwaters from the Galloway Drain. This caused frequent flooding throughout the golf course which not only contributed to the deterioration of the stream, but the untreated floodwaters and stormwater runoff increased downstream nutrient (phosphorus from fertilizers). In addition, it reduced golf course revenue as several holes were often unplayable. Niswander Environmental, in coordination with the MDEQ, conducted a hydrogeomorphic assessment of the stream to provide the baseline data required for the natural channel design. Specifically, the assessment involved documenting the existing characteristics of the stream and predicted the stream’s capacity to move water through the system. Based on the assessment, it was determined that the stream was undersized and lacked proper grade, and therefore widening and grade stabilization was incorporated to accommodate flow through the system, preventing excessive flooding and channel downcutting. Five Naturalized Areas were designed as flood storage areas to direct flood waters away from the golf greens and allow for proper treatment of stormwater runoff. The Naturalized Areas and riparian buffer will achieve many goals such as increasing stormwater infiltration, reducing direct runoff of nutrients to the Galloway Drain, reducing stream bank erosion, and restoring the natural flow regime. Niswander Environmental completed design for the golf course Naturalized Areas including landscape plans, streambank stabilization and Natural Channel design. This required close coordination with the project engineer and golf course staff to ensure that the project met all standards for golf course playability. The timing and staging of the project was crucial since construction was done during the playing season and all measures were taken to minimize disturbance to the remaining golf course operations. Niswander Environmental coordinated MDEQ permitting and stream design requirements that were in-depth due to the extensive in-stream work required. Niswander Environmental also completed construction documents for bidding the project including construction specifications (for earthwork, planting, seeding, in-stream structures, and streambank stabilization work) and cost estimates. Niswander Environmental performed construction oversight and contractor administration of all issues relating to the Naturalized Areas and stream work. Construction work was completed in 2010. Niswander Environmental also provided grant reporting and administrative services for this project funded through the Federal American Recovery and Reinvestment Act as disseminated by a State Revolving Fund grant. This required strict reporting and accounting of all expenditures with justification for all plans related to this project.